Comfortis for dogs is a chewable, tasty tablet for the treatment and prevention of flea infestations in dogs. The Comfortis flea control product should be administered with food or immediately after feeding. The duration of efficacy may be reduced if the dose is administered on an empty stomach. If vomiting occurs within one hour after administration and the tablet is visible, you give another full dose. When a dose is missed administering the product to the next feeding and begin a monthly dose schedule again. The flea protection can be safely administered at the recommended dose at monthly intervals. Comfortis tablets are chewable and tasty. If the dog does not directly accepts the tablets, they may be administered with food. 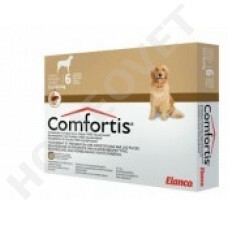 Comfortis is administered once a month, with the selection of the appropriate tablet depends on the weight of the dog. Fleas can be present for some time after the application of the product, because fleas develop from the already existing pupae in the environment. 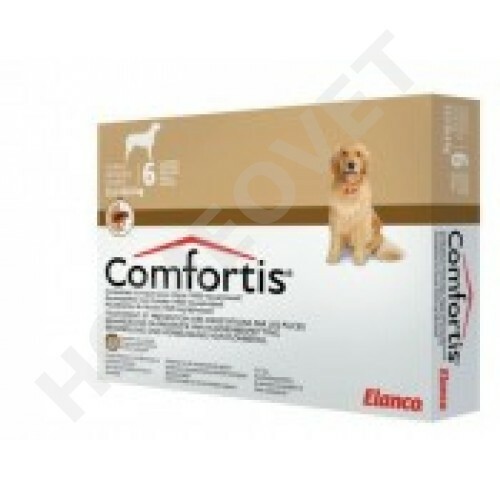 The regular monthly treatment with Comfortis breaks the life cycle of fleas and may therefore be necessary for the control of flea populations in contaminated households. What are the possible side effects of Comfortis? Side effects that may occur include vomiting. If vomiting occurs within one hour of administration, redose with another full dose. Other side effects may occur. Continue giving Comfortis chewable tablets and talk to your veterinarian if your pet experiences decreased appetite, lethargy or decreased activity, diarrhoea, cough, increased thirst, vocalization, increased appetite, redness of the skin, hyperactivity and excessive salivation. Talk to your veterinarian about any side effect that seems unusual or especially bothersome to the pet. Contraindications; Do not use in dogs under the age of 14 weeks. Not use in case of hypersensitivity to the active substances or to any of the ingredients. In dogs with known epilepsy use with caution. For dogs weighing less than 3.9 kg, accurate dosing is not possible, therefore the use of veterinary medicinal products in these dogs is not recommended. The safety of spinosad during pregnancy and lactation has not been adequately tested . Side effects that may occur include vomiting. If your pet is experiencing lethargy, decreased appetite, weight loss, diarrhoea, or any other difference in behavior, contact your veterinarian. The FDA has received reports of adverse reactions in dogs receiving the drug Comfortis (spinosad) concurrently with high, extra-label doses of ivermectin. Dogs receiving extra-label doses of ivermectin to treat non-responsive demodectic mange and other conditions have developed signs of ivermectin toxicity. Ivermectin is an ingredient found in heartworm preventatives such as Heartgard Plus, Heartgard, Iverhart Plus and Ivomec.